Our parish provides many choices for sharing your gifts of treasure: Envelopes are mailed directly to the homes of all registered parishioners. The envelopes include weekly envelopes for two months as well as the envelopes for our Building Fund. We also provide Electronic/On-line choices for those who prefer this option: We do request that if you would like to use this option that you still use the envelopes mailed to your home and simply check the box that indicates that you give electronically. If you would like to give Electronically and need assistance please either call or drop by the office and fill out an Authorization Form to begin. True giving to God is one of the most important ways we offer worship. By sharing our treasure with God in heartfelt thanksgiving we show worship and praise. True giving is a gauge of evaluating the generosity and sincerity to which we each share with God. In the Gospel St. Paul wrote, “Each of you must give as you have made up your mind not reluctantly or under compulsion.” 2 Corinthians 9:7 St. Paul did not say, “Each of you must give based on your bills and expenses.” As God’s children we must never forget that we have unseen resources. As a matter of fact, our unseen resources are greater than those we can see. “For this slight momentary affliction is preparing us for an eternal weight of glory beyond all measure, because we look not at what can be seen; for what can be seen is temporary, but what cannot be seen is eternal.” 2 Cor. 4:17-18. What is sacrificial giving? It is the next level of giving. Giving at this level makes a dent in our pockets, time, or resources. At this level we give not from our reserves but from our operating capital. Thus people are encouraged to dig down deep and “give until it hurts.” Some of us can’t give very much before we start hurting! Some of us start hurting after giving two or three dollars, no matter how much abundance we may have. Some start hunting after giving ten or twenty dollars. Some of us don’t have to give anything to hurt; we start hurting when the very subject of giving is brought up! Sacrificial giving is the best opportunity we have to lay down our lives for God, as He has done for us. It is the proving of our trust and strength in God. What is the goal? The goal should not be to give until it hurts, but to give until it feels good. What the word stewardship refers to: Giving back what God has bestowed on us. This includes the whole family or household. Stewardship is an expression of discipleship, with the power to change how we understand and live out our lives. God loves a cheerful giver. How do we become cheerful givers? Giving out of a sense of comparison or competition doesn’t feel good – that kind of giving comes from the ego. Giving by looking at our bills or resources doesn’t feel good – that kind of giving comes from the head. Giving grudgingly doesn’t feel good – it’s done sparingly. Necessity giving doesn’t feel good – it’s done out of fear. Giving feels good only when it comes from the heart. True giving is not simply a matter of the change in your pocket; it is a matter of the abundance of your heart. Giving from the heart is the giving of love. And it feels good to love. Not only does God love the cheerful giver, but the cheerful giver loves God. Out of my love for God, and in gratitude for the many blessings I have been given, I will give back to the Lord the first portion of all that I have received. Recognizing that the true nature of love involves sacrifice – whether it is between husband and wife, parent and child, and that of Jesus on the cross – my gift from the first portion to God will involve a sacrifice. It will have a bite to it; it will be a little more than I think I can afford. It will express my faith in God. Realizing that Scripture speaks of a tithe of 10% as the norm (Mal. 3:8-10), I will give back to the Lord 10% of all that I receive by way of income. I remember that the Lord Jesus held up the widow’s mite (Luke 21:2) as the standard by which his disciples should exercise stewardship. I understand that I might divide my tithe and give 5% to my parish and the other 5% to charities such as the Master Plan Campaign, other second collections, the Annual Catholic Appeal, the United Way and other personal charities. Remembering that “the Lord loves a cheerful giver” (2 Cor. 9:7), I will consider my envelope as a wrapping for my gift. I will deposit it prayerfully and joyfully into the collection basket. Are you ready to donate? Thank you to all who have or will share their Stewardship of Treasure to support the good works of St. Mark’s Catholic Parish and its ministries and extensive programs for all ages. St. Mark’s strategy and philosophy on Stewardship is that Stewardship is a way of life. It is a way of thanking God for all His blessings by returning a portion of the time, talent and treasure that has been allotted to us. Through the generosity of our parishioners giving their time, their talents, and their treasure, we have made a significant impact in the community. The evidence of our Stewardship Commitment shows in our parish. It begins internally with active support of the parish facilities and programs, including the construction of our John Paul II Catechetical Center. The St. Mark’s Capital Campaign to “Open Wide the Doors to Christ” was the key to our future several years ago. Today, our Building Fund donations continue paying down our loan on the completed Catechetical Center, Gathering Plaza, expanded parking, additional lighting and newly landscaped grounds. With many religious education programs, youth programs and adult faith formation programs, we need to share our treasure to continue to provide a place to share God’s word and His faith through our continued education of all ages. 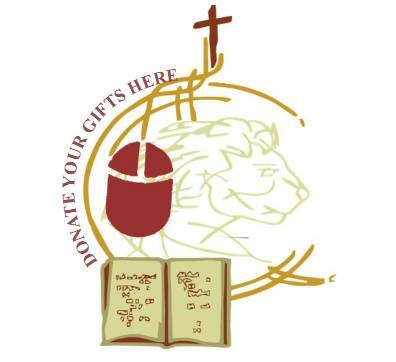 Our donations support spiritual activities to support for our parish families. Stewardship At St. Mark’s extends well beyond our parish boundaries with numerous outreach programs and activities in the community. As Good Stewards, you’re invited to make tithing a long-term goal in your family’s financial sharing. Believing that God calls us to be Stewards of all creation, we ask that you share half of your tithing 10%. Be prayerful in making your decision to share what God has given you. This Holy Ground Belongs to All of Us! To make a donation on-line click on icon above.